The CBOE PutWrite Index has outperformed the BuyWrite Index by approximately 1.1 percent per year between 1986 and 2015. That is pretty impressive. But troubling. Yes – troubling – because the theory of put-call parity tells us that such outperformance should be almost impossible via a compelling no-arbitrage restriction. This paper explains the mystery of this outperformance, which has implications for portfolio construction. "Writing equity index covered calls is an effective approach to jointly earning the equity and volatility risk premium. So too is writing naked equity index put options. Which approach is better? Many investors compare the historical performance of the two approaches for the answer, potentially leading to the conclusion that put-writing is preferable to covered calls. On the surface, it appears that writing put options would be the preferred approach. The CBOE PutWrite Index (PUT) has outperformed the BuyWrite Index (BXM) by approximately 1.1 percent per year between 1986 and 2015. That is pretty impressive. But troubling. Yes – troubling – because the theory of put-call parity tells us that such outperformance should be almost impossible via a compelling no-arbitrage restriction. The primary reason behind the performance difference in the PutWrite and BuyWrite Indices is due to a construction difference during just four hours per month. A quirky difference in their portfolio construction results in the PutWrite Index missing out on approximately four hours per month of S&P 500 Index return relative to the BuyWrite Index. Each month on the morning of option expiration, both the BuyWrite’s call option and the PutWrite’s put option expire and settle at the same time at the Special Open Quotation (SOQ). At this time, option expiration fully divests the PutWrite Index of its equity exposure. Until it re-establishes a short put option position, it is a zero beta portfolio. In contrast, at the same time, the BuyWrite portfolio becomes a beta one portfolio with the expiration of its call option, because it is fully invested in the S&P 500 Index with no corresponding short call option position. It remains a beta one portfolio until it re-establishes its short call option position. So, over this four-hour window, the BuyWrite Index is over-exposed to the S&P 500 relative to its longterm average exposure. Similarly, the PutWrite Index is under-exposed to the S&P 500 relative to its long-term average exposure. As an example, on average, between 2004 and 2015, the S&P 500 Index was down 23 basis points on option expiration mornings. The equity returns over this four hour period 12 times per year suggests 2.7% of annual underperformance for the BuyWrite Index relative to the PutWrite Index. Adding back in the intercept (annualized) provides a combined effect of 2.0% of annualized expiration-date underperformance. This is very close to the 2.1% the BuyWrite Index underperformed the PutWrite Index over the same 2004 to 2015 period." "In this paper we show the importance of portfolio construction when it comes to capturing factor premiums efficiently. We first show that the simplest and most traditional approaches to factor investing tend to generate lower risk-adjusted returns because of uncontrolled risk and unwanted exposure to the market index or market capitalization biases. We show that strategies that target constant volatility and hedge the market beta and exposure to size deliver higher information ratios. This is in particular due to a reduction in volatility. We also show the importance of removing sector exposure as an additional source of risk without return in factor investing. And we explain why long only factor investing can rather efficiently capture factor premiums, in particular from the low risk and momentum factors. Additionally, we demonstrate the importance of diversifying factors in each style thanks to the decorrelation of factor returns even within the same style. Finally, we show that factor premiums tend to exhibit fat tails, but also a relatively small skewness. Overall, we defend the importance of purifying and diversifying factor exposures in factor investing as one way of significantly improving risk-adjusted returns from factor strategies. And although this causes turnover to increase due to the need for additional trades, we highlight the fact that most of the benefits shown in this paper can be captured in practice by using clever approaches to contain turnover." Existing research has documented cross-sectional seasonality of stock returns – the periodic outperformance of certain stocks relative to others during the same calendar month, weekday, or pre-holiday periods. A model based on the differential sensitivity of stocks to investor mood explains these effects and implies a new set of seasonal patterns. We find that relative performance across stocks during positive mood periods (e.g., January, Friday, the best-return month realized in the year, the best-return day realized in a week, pre-holiday) tends to persist in future periods with congruent mood (e.g., January, Friday, pre-holiday), and to reverse in periods with non-congruent mood (e.g., October, Monday, post-holiday). Stocks with higher mood betas estimated during seasonal windows of strong moods (e.g., January/October, Monday/Friday, or pre-holidays) earn higher expected returns during future positive mood seasons but lower expected returns during future negative mood seasons. "We propose here a theory based on investor mood to offer an integrated explanation for known seasonalities at both the aggregate and cross-sectional levels, and to offer new empirical implications which we also test. In our model, investor positive (negative) mood swings cause periodic optimism (pessimism) in evaluating signals about assets’ systematic and idiosyncratic payoff components. This results in seasonal variation in mispricing and return predictability. Consistent with the model predictions, we uncover a set of new cross-sectional return seasonalities based on the idea that stocks that have been highly sensitive to seasonal mood fluctuations in the past will also be sensitive in the future. In other words, we argue that some stocks have higher sensitivities to mood changes (higher mood betas) than others, which creates a linkage between mood-driven aggregate seasonalities and seasonalities in the cross-section of returns. In particular, we argue that investor mood varies systematically across calendar months, weekdays, and holidays. In consequence, a mood beta estimated using security returns in seasons with mood changes helps to predict future seasonal returns in other periods in which mood is expected to change. During our sample period 1963-2015. the average stock excess return (measured by CRSP equal-weighted index return minus the riskfree rate) is highest in January and lowest in October. Thus, we focus on January as a proxy for an investor high-mood state and October for a low-mood state. Using Fama-MacBeth regressions, we verify the finding of Heston and Sadka (2008) for January and October—historical January (October) relative performance tends to persist in future January (October) for the following ten or more years. In our interpretation, stocks that do better than others during one month will tend to do better again in the same month in the future because there is a congruent mood at that time. Furthermore, we find a new reversal effect that crosses months with incongruent moods; historical January (October) returns in the cross section tends to significantly reverse in subsequent Octobers (Januaries). A stock that did better than other stocks last January tends to do worse than other stocks in October for the next five years or so. A one-standard-deviation increase in the historical congruent (incongruent)-calendar-month leads an average 23% increase (17% decrease) in the next ten years, relative to the mean January/October returns. Our explanation for these effects is not specific to the monthly frequency. A useful way to challenge our theory is therefore to test for comparable cross-sectional seasonalities at other frequencies. Moving to the domain of daily returns, we document a similar set of congruent/incongruent-mood-weekday return persistence and reversal effects. We confirm this return persistence effect for Monday and Friday returns, and then show, analogous to the monthly results, that a congruent-mood-weekday return persistence effect applies: relative performance across stocks on the best-market-return (worst-market-return) day realized in a week tends to persist on subsequent ten Fridays (Mondays) and beyond, when good (bad) market performance is expected to continue. A one-standard-deviation increase in historical congruent-weekday or congruent-mood-weekday return is associated an average with a 4% or 12% higher return in the subsequent ten Mondays/Fridays. At the level of individual stocks, there is pre-holiday cross-sectional seasonality, wherein stocks that historically have earned higher pre-holiday returns on average earn higher pre-holiday returns for the same holiday over the next ten years. The cross-sectional return persistence and reversal effects across months, weekdays, and holidays are overall consistent with our theoretical predictions that investors’ seasonal mood fluctuations cause seasonal misperceptions about factor and firm-specific payoffs and lead to cross-sectional return seasonalities. These predictions are based on the idea that different stocks have different mood beta—a stock’s return sensitivity to factor mispricing induced by mood shocks. We argue that the concept of mood beta integrates various seasonality effects. We therefore perform more direct tests of the model prediction that mood betas will help forecast the relative performance of the stocks in seasons with different moods." Cross-sectional mean reversion in stocks (strong tendency of stocks with strong gains/losses to reverse in a short-term time frame - up to one month) is a well-known market observation and the main reason why so many academic researchers generally use a 2-12 momentum measurement (returns over the past 12 months, excluding the previous one) when examining momentum anomaly. Many academic papers examined this effect, the most notable are papers by Jagadesh, and Bruce Lehmann (see "Other papers" section on Quantpedia subpage for this reversal strategy for additional academic research papers). The most academics speculate that the fundamental reasons for the anomaly are market-microstructure frictions (bid-ask bounce) or investors' cognitive biases - overreaction to past information and a correction of that reaction after a short time horizon. But is this simple equity strategy still profitable? Matthew Lee from Quantopian performed an independed analysis during an out of sample period from 12-01-2011 to 12-01-2016. Overall, the performance of simple short-term equity reversal strategy is below the market. But, it's to be noted that this strategy is long/short compared to just long-only equity benchmark (which is the SPY). So if we want to compare total performance of that strategy, we should compare long only reversal of the "loser stocks decile". 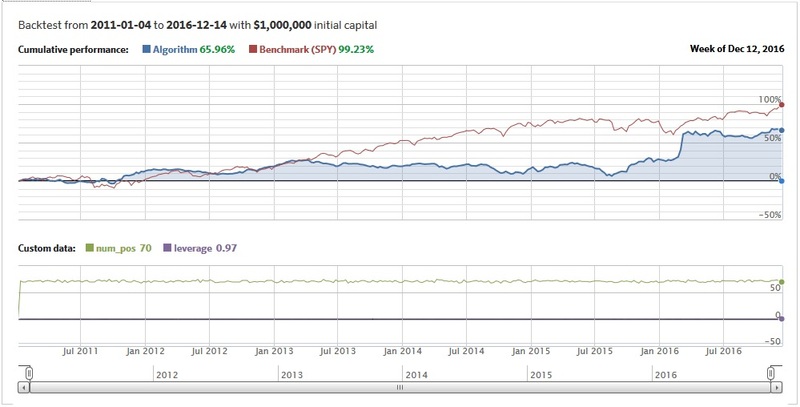 Long/short equity reversal strategy has a Sharpe ratio 0.84 and Beta of 0.15. Sharpe ratio of long/short version is comparable to market portfolio and a low correlation of equity reversal strategy makes it a possible addon to investment portfolio. However ... Reversal strategy is very active (weekly, bi-weekly rebalancing) which means high transaction costs and slippage. So really high caution should be paid in a real-world implementation and steps which tries to limit strategy's turnover should be taken. Thanks for the analysis Matthew! This paper investigates the relation between monetary conditions and the excess returns arising from an investment strategy that consists of borrowing low-interest rate currencies and investing in currencies with high interest rates, so-called "carry trade". The results indicate that carry trade average excess return, Sharpe ratio and 5% quantile differ substantially across expansive and restrictive conventional monetary policy before the onset of the recent financial crisis. By contrast, the considered parameters are not affected by unconventional monetary policy during the financial crisis. ffect market expectations during this time. For investors, this evidence suggests that rewards from carry trade vary with changes in monetary conditions only during "normal" times. For researchers, this evidence suggests that recognising the relevance of monetary policy is crucial to understanding the pricing implications of FX volatility risk for carry trade."